He spotted a group of little boys, done up not as super-heroes or figures of modern legend but in outsized pin-striped suits and ties. One had a big briefcase, another carried a toy mobile phone, a third waved a rolled-up umbrella about. "They're being you," said a voice at his elbow. It was Mordecai Hershkovits. Haringey, North London, a spring day. 41 year-old local “journo” Rex Tracey sits in a traffic jam at the wheel of his mate Terry's car and he is terrified. Beside him, Terry tells him to calm down. But Rex hasn't driven since the accident ten years ago and tomorrow he has to retake his test. Photographer Terry has agreed to give Rex some coaching as they drive to Finsbury Park to interview a local history writer. Rex botches his parking and crunches into the car behind. Unfortunately its driver turns out to be Dr George Kovacs, not only the aforesaid local author but also a disagreeable neighbour of Terry's. After some prickly words the trio enter the park which today is full of people celebrating spring, including a Hasidic family picnicking at a table despite being harangued by a young Muslim man. Terry's photography session with Kovacs is cut short by a woman's scream. Turning, they see the picnicking family slumped over their dishes as if asleep. But they are dead. And the screaming woman is accusing a group of young Muslim men of spraying something at the family. The youths scatter and run. Dr Kovacs, visibly shaken, also leaves in a hurry. THE TOTTENHAM OUTRAGE is the second crime novel by writer M H Baylis (aka Matt Baylis, aka Matthew Baylis) featuring Haringey journalist Rex Tracey. It follows on from Tracey’s début in DEATH AT THE PALACE (“Alexandra”) and continues Baylis's love song to the melting pot which is modern-day Haringey. With his photographer friend Terry accused of murder, Rex continues to look into the deaths of the Bettelheims and Dr Kovacs. His investigations take him deeper into the lives of the Hasidic community of Stamford Hill, the roots of whose sects and Rebbe lie in the villages of 18th century Poland. This is a richness of traditions not often explored in crime fiction although it brings to mind aspects of Michael Chabon's alternative-future crime novel, THE YIDDISH POLICEMEN'S UNION. Embedded into this modern tale of death in Finsbury Park are flashback narrations recounting the story of the shootings and failed anarchist robbery of 1909, the original "Tottenham Outrage". These narrated segments pop up in the text with no prompting – but, such is the assurance of Baylis's writing, the voice of its narrator, the mysterious and tough George Smith, is vivid and distinct from Rex's story and makes a great counterpoint to that of Rex. 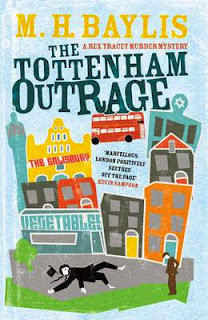 I lapped up THE TOTTENHAM OUTRAGE: jam-packed both with characters and with character: funny, vivacious and enthralling. It's written with skill, observation, understanding and a relish for contemporary life in a teeming part of London that will, I hope, provide many more stories for Rex to tell. Read and enjoy.